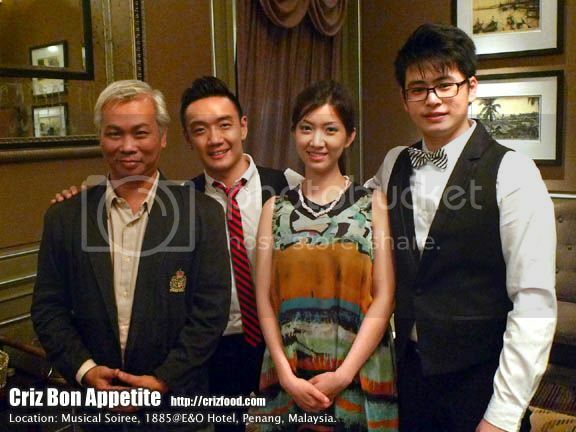 It was a unique dining experience when we were treated with a robust Musical Soiree by three excellent performers which consisted of Zhang Chi (pianist), Teresa Ong (soprano) and Sean Ooi (tenor), during a recent visit to 1885@ E&O Hotel recently. The first segment of an ongoing project, to be held for 5 consecutive months, was the brainchild of loyal hotel residents, Mr. & Mrs. Martin Rutherford, and the Resident Manager of E&O Hotel, Mr. Harold Rainfroy. The performance would be held on the first Thursday of each month. 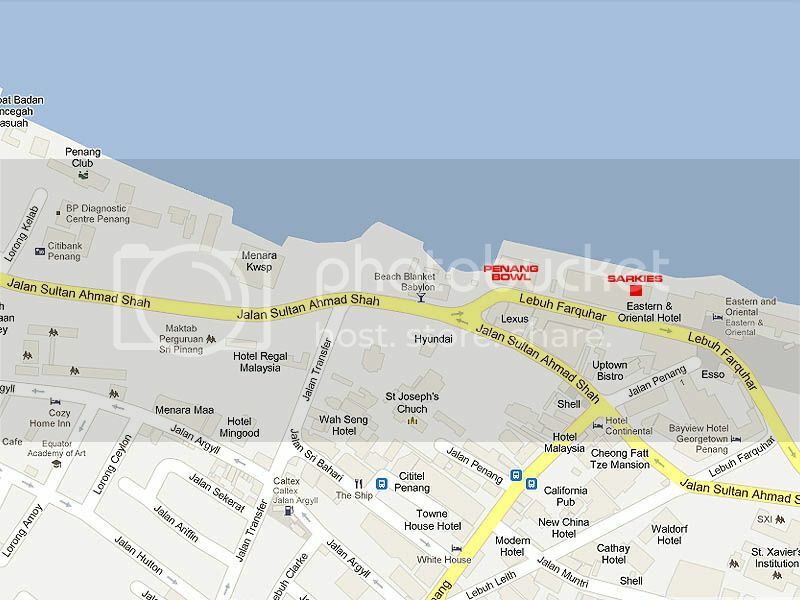 Please check the E&O Hotel Facebook for more information on the coming events. Price is at RM200++ per pax. Their performances were in 3 sessionss. The first one included Etude Op.15″ (Zhang Chi), “O Holy Night” (Sean Ooi), “Xue Hua” (Teresa Ong), “If You Loved Me” (Sean Ooi) and “Il Ba Cio” (Teresa Ong). The second session included “Liu Yang River” (Chang Zhi), “Nella Fantasia” (Sean Ooi), “E Pur Cosi/ Piangero La Sorte” (Teresa Ong), “Non Ti Scordar Di Me” (Sean Ooi) and “Laughing Song” (Teresa Ong). The finale session had Zhang Chi rendering the “Waltz Op. 64 No.2 & Op. 34 No. 5”, followed by “All I Ask of You” and “The Prayer” (Duet by Sean Ooi & Teresa Ong). The numerous awards winning song “The Prayer” written by the famous songwriter, David Foster, made famous by Canadian singer, Celine Dion and blind Italian tenor, Andrea Bocelli, has always remained as my personal favorite. 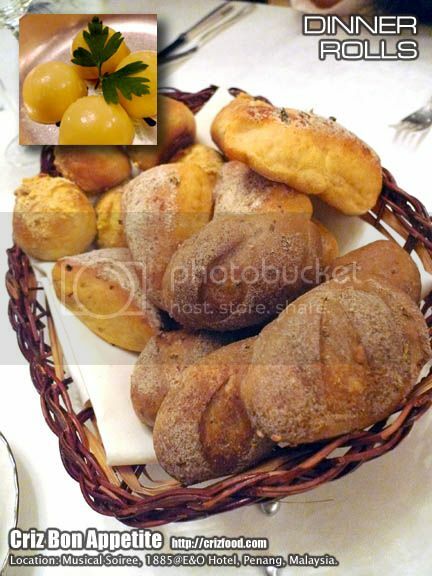 At 1885 @ E&O Hotel, meals would always start with some lovely dinner rolls, served with their creamy butter. The aroma emitted from the freshly bakes combined with the fine soft yet fluffy textures from the in-house made dinner rolls would always be the best starter for any meal. 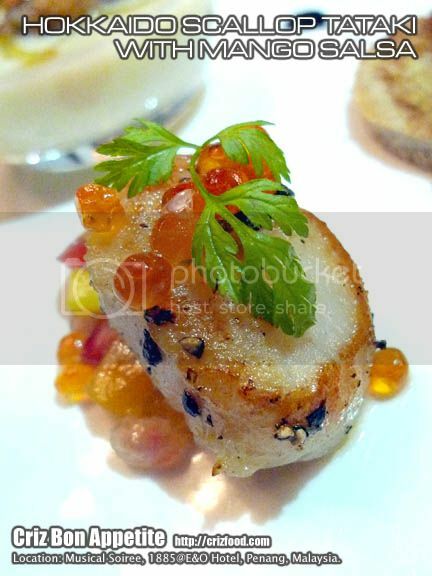 Our actual fine dining experience kicked off with a palate dinner of awesomely presented Trio Appetizers which consisted of Hokkaido Scallop Tataki served with Citrus Mango Salsa, Foie Gras Terrine with Cinnamon Brioche and Vichyssoise with Norwegian Salmon Tartare. This appetizers came paired with the Hole In The Water Marlborough Sauvignon Blanc. The Hokkaido Scallop Tataki served with Citrus Mango Salsa was actually a briefly seared fresh scallop which had firm and creamy texture in each bite. It was served on a fruity yet mildly spiced up citrus mango salsa with bursting omega-3 fatty acid filled salmon roes as garnishing. It was a perfect combination. Next on the plate was the Foie Gras Terrine with Cinnamon Brioche. 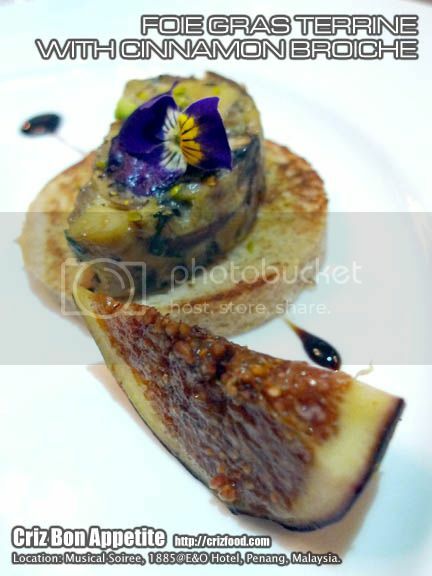 The foie gras terrine was one of the best I had tasted as it had added roasted shitake mushroom slices added in to tame the richness in the fatty duck liver. Combined with the light yet fluffy mildly cinnamon pepped up toasted brioche, it was another perfect dish. The appetizer also came with a slice of ripen fig to sweeten up the savory flavors. 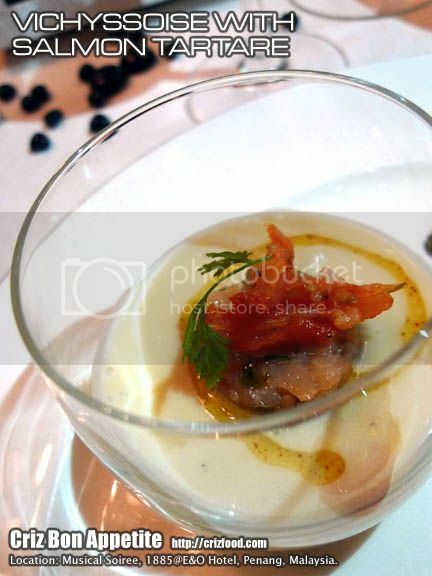 Finally the last of the appetizers was the Vichyssoise with Norwegian Salmon Tartare. The cold soup which had a combination of pureed potatoes, leeks, onions, stock and cream was smooth flowing with the complemented Norwegian salmon tartare, topped with some sauteed tomato and a drizzle of spiced olive oil. 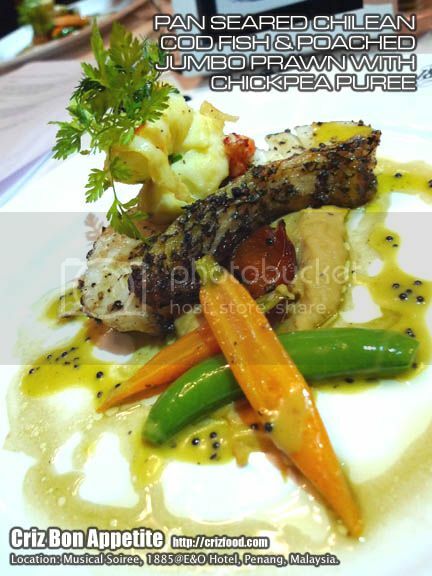 After another session of great performances by the trio, we were served with the main course – Pan Seared Chilean Cod Fish & Poached Jumbo Prawn with Chickpea Puree, served with some semi dried tomatoes and some fresh basil sauce. The remarkable light and creamy textures of the thick slab of white fish, pan seared to perfection and the firm texture of the poached jumbo prawn, went well with the mildly butter spiced chickpea puree. With a magical drizzle of some freshly made basil sauce, the whole concoction had unique flavors of the next level. This dish came paired with the Matua Valley Marlborough Pinot Noir. Thumbs up! The much awaited desserts were presented to us after another session of the performances. Again, these desserts were served in trio such as the Valrhona & Almond Chocolate Cannoli, Chantilly Cinnamon Mango and Bavarois Berry Lava Cake. 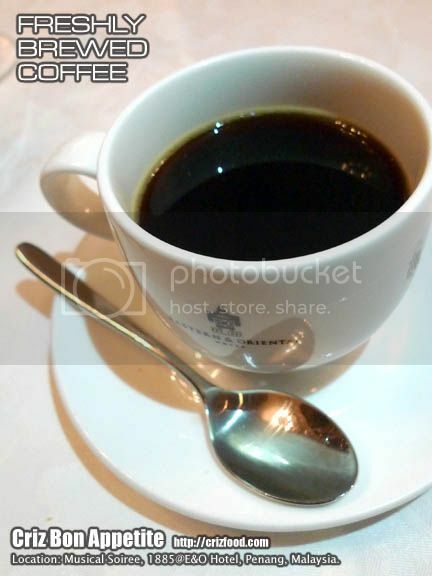 It always has been my priority to savor those with a sweeter note first before ending with something with fruitiness with light touch of sourness. I started off with the Bavarois Berry Lava Cake. I would say this dessert was a lava cake made too perfect as it ended up as a brownie without the much expected chocolate oozing out. 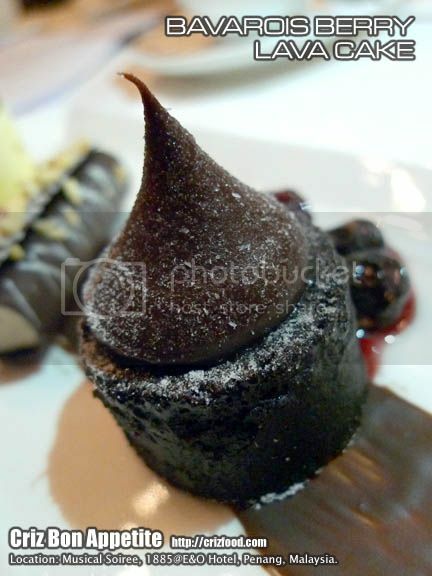 No doubt it was still a great dessert with a generous amount of ganache topping with some mildly sweetened berry compote. 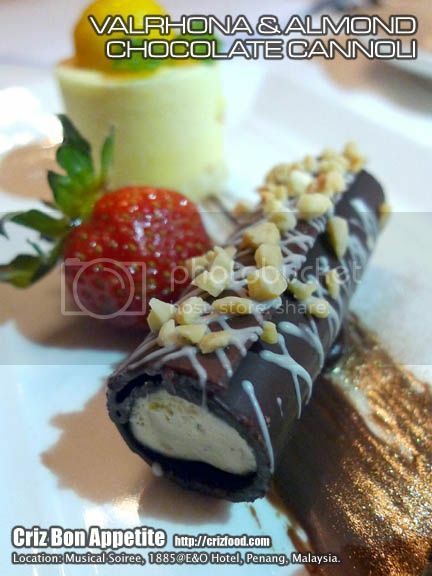 The Valrhona & Almond Chocolate Cannoli on the other hand would suit chocolate lovers well. You can imagine the contentment of having luxurious French chocolate filled ricotta like cream and topped with some toasted chopped almonds. It was heavenly but I personally feel that it was a bit too much of chocolate items for the day. I made a wise choice leaving the Chantilly Cinnamon Mango as the last option. 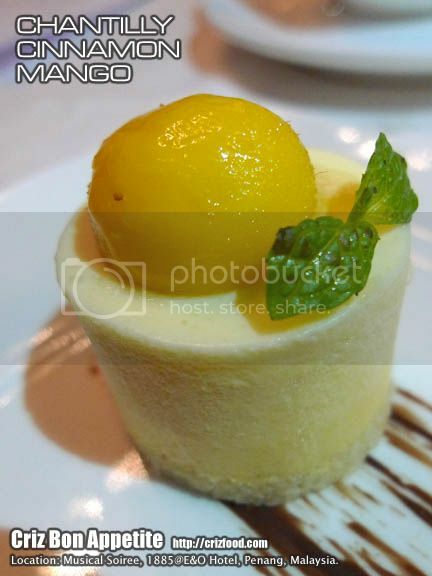 The almost light cheesecake texture cake blended in real nice with a fresh piece of mango. It was indeed a refreshing and most palatable dessert of the evening. The night ended with an astounding finale performance by the trio with diners being served with either a cup of freshly brewed coffee or a selection from their gourmet tea choices. 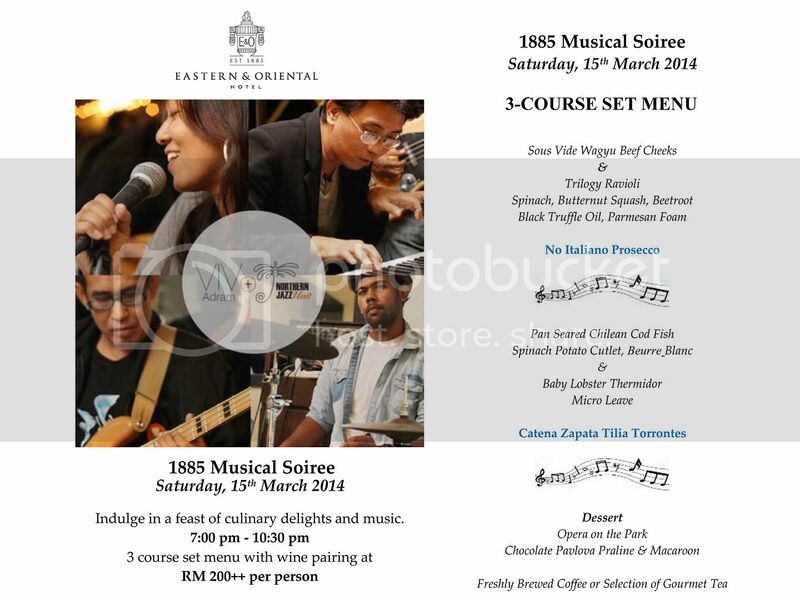 Overall, it was a great evening of different genre with great food, wine and musical performances. 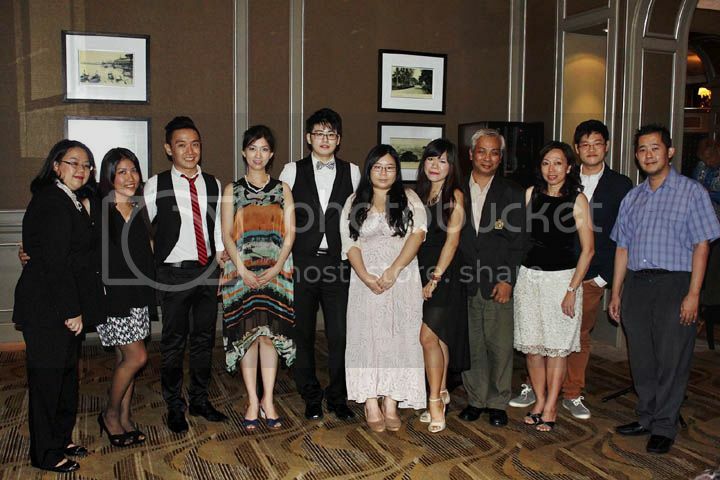 Finally, I would like to thank Eileen Chong, Communications & Public Relations Manager of E&O Hotel, for a great evening.